Infosearch BPO uses the best technologies to power our services in order to provide the best quality driven effective solutions. Our unique approach to provide consistent and significant customer service has helped many companies profitably success across various markets. Apart from this we offer cost-saving services to benefit our clients. With our expertise in Recruitment, it's easy for us to source the domain experts in any business to work for the customer service and other outsourcing operation. "True Value for lesser money"
We adopt custom made solutions to fit the client requirement thus providing cost effective Business Process Outsourcing (BPO) and Call center solutions so that the client can save huge money and at the same time the task gets accomplished by talented and skilled work force from our premises in India. Our proficient environment is fully weighted with an advanced telecom devices and IT solutions in order to tackle any kind of Call center and BPO Services. We maintain a smooth communication with our vendors in order to benefit them with best of the technology from our centers. As we all know that most of the industries are now facing a big threat of data protection to avoid misuse of data. But we at Infosearch has forecast-ed these kinds of issues and developed systems to cut down these awful activities. We take adequate steps to offer best outsourcing services which includes customer service, telemarketing, Lead Generation, Customer satisfaction surveys, help desk, technical trouble shooting, Data entry, chat services, email support, email marketing, SEO, etc., starting from the recruitment stage. With the help of technology like IVR (Interactive Voice Response) we collect confidential details like Bank, credit card, social security number (SSN), Card details, bank details, driving license etc. We facilitate our customers with DID (Direct Inward Dialing) facility in order to call us back for any queries or complaints. We adopt paper less, restricted internet and high level of internet security to avoid Data seepage. It's becoming important that any outsourcing center has to be complaint proof. Infosearch is fully filled filled with knowledge, skilled resources that elegantly matches with our clients unique requirements and needs. More than 10 years of experience in BPO and Call center services. Provide reliable,sustainable and secure solutions. We understand the company objectives to outsource which are reviewed at regular intervals. We define realistic goals in accordance with the expectations of the client company. We set up the quality indicators to measure our call center outsourcing and BPO performance and draw up a quality insurance plan. We decide people who would be in charge to whom the calling agents would report to. Training manuals are designed to suit the project needs of client. Recruitment are done and extensive training is given to employees in accordance with the project needs. Assessment of quality and quantity gaps between actual and expected and identify solutions to overcome them. Our company is driven by Values, Commitment and Dedication and thus we stand out in the crowd. Everybody knows that the preferred and favorite station for knowledge based professional work force will be India always. At Infosearch we will hire the employees in such a way that it meets the highest customer service standards with unique experience and skills. 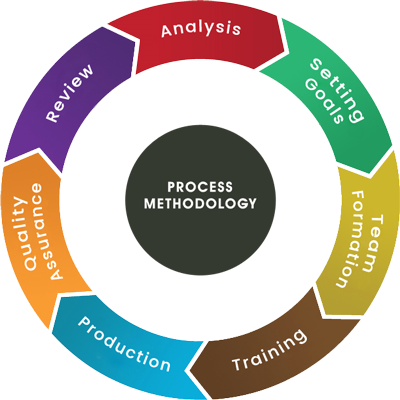 We serve our International clients in this model of business process outsource as we record a very successful off shore outsourcing. We understand the business implication and have adopted continuous improvement to give the best service to our clients.